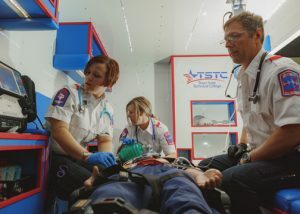 (HARLINGEN) – The Emergency Medical Services program at Texas State Technical College will soon be offering certificate and associate degrees – a move that will help the increased demand for skilled paramedics in the region and the state. The new accreditation will allow eligible students to use financial aid for tuition, books and supplies. The EMS course has been under Workforce Development and Continuing Education for more than a decade. Acevedo and his team have worked hand-in-hand with TSTC in Abilene’s EMS program to ensure the process of accreditation for the transition was completed correctly. The program received accreditation through the Commission on Accreditation of Allied Health Educational Programs upon recommendation of the Committee on Accreditation of Education Programs for the Emergency Medical Services Professions in February 2017 and since then faculty have continued to work closely with the EMS program in Abilene to align curriculum. TSTC Allied Health Division Director Andy Weaver said moving the program out of continuing education will make a positive impact on TSTC, its students, Harlingen and the state. TSTC in Abilene’s program has 140 students currently enrolled. Weaver said the Rio Grande Valley is in Trauma Service Area V, which serves four counties and more than 1.3 million residents, so there is no lack for competent and safe healthcare providers, with starting pay between $40-60 thousand per year. Acevedo said the program’s new structure will allow more class time, hands-on training and technical skills integration with simulators and virtual reality for the students to use. The program will also include clinical rotations at various sites throughout the Valley. Beginning this spring, students who enroll in the program will have the option of obtaining a basic emergency medical technician certificate, advanced EMT certificate or a paramedic associate degree. At the end of the two-year paramedic course, graduates of the program will take a two-part test covering comprehensive and skills. The National Registry of Emergency Medical Technicians exam is a required paramedic licensure. Passing the national registry will make the graduate eligible to work anywhere in the United States. Once licensed, a paramedic can find work with emergency service companies, hospitals, schools or in oil fields as a safety officer. Currently, under continuing education, the EMS program has a 100 percent job placement rate. Applications for the Spring 2019 EMS class are now being accepted through the end of November. The application can be found online at tstc.edu/programs/EmergencyMedicalServices. For more information, call 956-364-4741. This entry was posted in Harlingen on September 3, 2018 by Amanda Sotelo Sotelo.